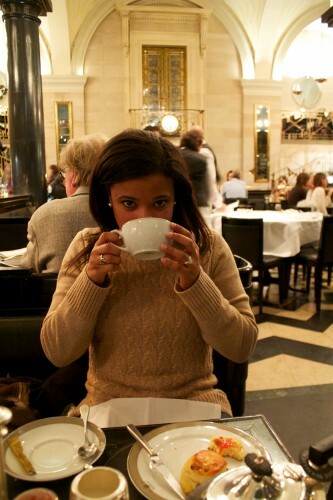 Afternoon tea is everywhere in London and it’s something I’ve dreamed about ever since we planned our trip. What could be more “London” than sitting in a warm dining room, drinking tea and eating scones, while the wind and rain pound against the building? It is so common in London and we easily took part in the ritual two times during our weeklong stay. 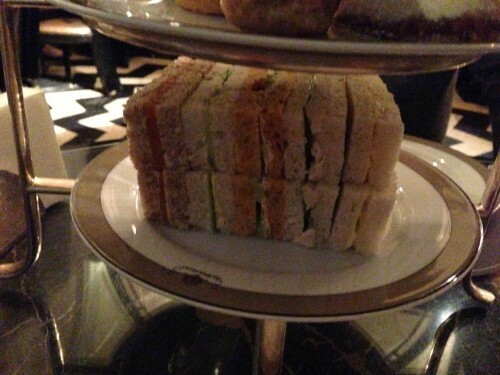 However, I didn’t know anything about the history of afternoon tea until after we returned. I found this site, which gives a brief history lesson: In the nineteenth century, Anna, the 7th Duchess of Bedford, started the tradition of afternoon tea as a late afternoon snack between breakfast and dinner. She eventually started to invite friends to tea and the practice caught on among society. Afternoon tea is generally served around 4pm and is not to be confused with “high tea” – this was traditionally served to the middle and lower classes and it consists of a heavier meal served later in the day (5 or 6pm) as a substitute for dinner. Even without the above history lesson, we were able to enjoy our afternoon tea. 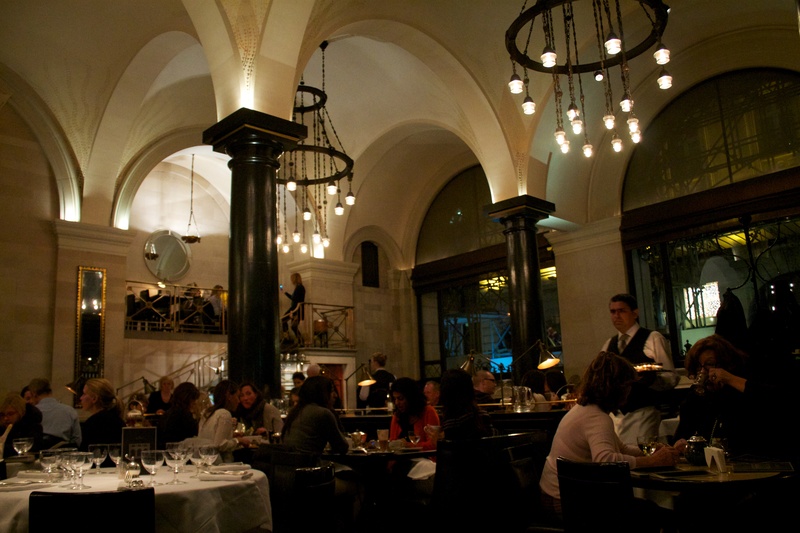 Our hotel was just down the street and across the way from The Ritz, but we opted for the cheaper and still opulent dining room of The Wolseley for tea-time experience. I must apologize for the pictures – some are from my iPhone and the room was dimly lit, resulting in less-than-stellar pictures. But I can assure you that the experience was first class, and I would highly recommend this to anyone visiting London. It’s a great way to unwind and refuel after a long day of exploring. We tried the champagne tea the first time around, which includes a glass of champagne (before the tea) and extra treats to eat with the tea. In addition to the fruit scones, clotted cream, and strawberry jam, the champagne tea comes with an assortment of pastries and sandwiches. The patries included a coffee eclair, cheesecake, chocolate cake, a lemon tart with burnt sugar on top, a pink & yellow checkered cake with fondant (or something like that) around the outside, and a pistachio and cherry “cookie sandwich” – it had pistachio cookies or pastries on the top or bottom and a cream or mousse in the middle. The sandwiches came out crustless (just as I had imagined! ), cut into dainty rectangles. There were five sandwiches, each with two rectangles so we didn’t have to worry about sharing. We had the following: smoked salmon, cucumber, celery & cream cheese, chicken & tarragon, and egg salad. My favorites were the smoked salmon and the celery & cream cheese, but they were all delicious (we ate the sandwiches with our champagne while we waited for our pot of cream tea to come out). We ordered the Wolseley Afternoon Blend, which I had with cream and sugar. The homemade fruit scones with clotted cream and strawberry jam were the perfect complement to the tea. We opted for the cream tea on our second visit and we were rewarded with a total of 6 fruit scones. I did not miss the pastries and sandwiches and left without feeling stuffed. Unless you are looking for a substantial amount of food, I would recommend the cream tea. Not only can you save money, but the scones are the star of the show and plenty of food for a snack to hold you over until dinner. And you will get the same great service and sit in the same fancy dining room. While I can’t comment on the hundreds of other tea places around town, I imagine that the experience is similar (though the prices can get much higher). 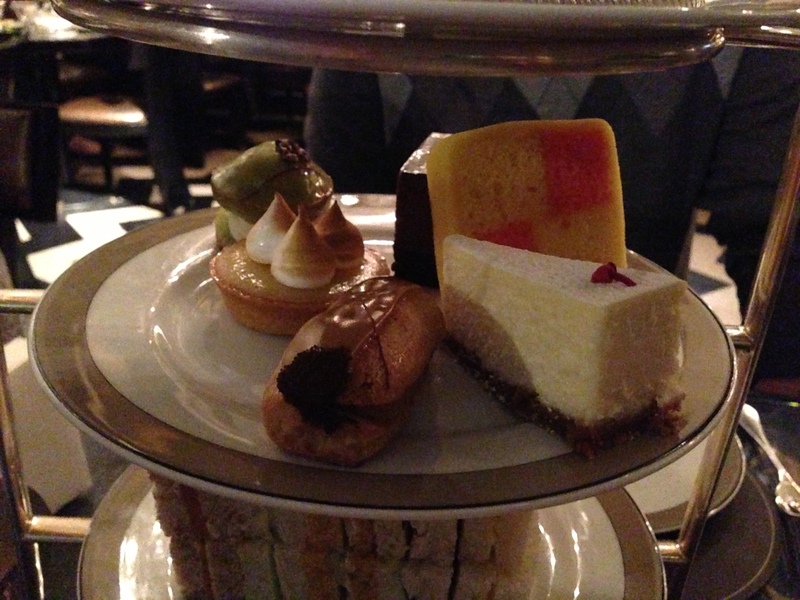 The prices at the Wolseley were £9.75 per person for the cream tea (tea and scones), £22.50 per person for the afternoon tea (which added the pastries and sandwiches), and £32.50 per person for the champagne tea (afternoon tea + champagne). It’s served from about 3:00pm to 6:00pm, depending on the day of the week, and reservations are accepted but not required. We walked in both times – the first day we were seated right away, and the second we waited in the bar area for about 5-10 minutes. 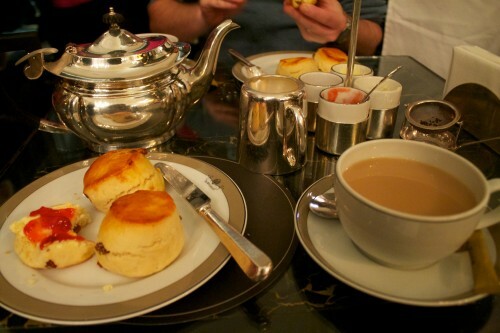 I’m not sure how often those living in London can actually enjoy afternoon tea, but I highly recommend it as a tourist! It was definitely a highlight of the trip and a way to take a breather from our busy day and be spoiled for an hour. This entry was posted in Food, Recommendation, Things To Do, Travel and tagged England, Europe, food, London, London 2012 Trip, UK by Kristin. Bookmark the permalink.